Fast and Effective Embedded Systems Design is a fast-moving introduction to embedded systems design, applying the innovative ARM mbed and its web-based development environment. Each chapter introduces a major topic in embedded systems, and proceeds as a series of practical experiments, adopting a "learning through doing" strategy. Minimal background knowledge is needed to start. C/C++ programming is applied, with a step-by-step approach which allows you to get coding quickly. Once the basics are covered, the book progresses to some "hot" embedded issues – intelligent instrumentation, wireless and networked systems, digital audio and digital signal processing. 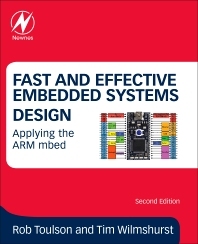 In this new edition all examples and peripheral devices are updated to use the most recent libraries and peripheral devices, with increased technical depth, and introduction of the "mbed enabled" concept. Written by two experts in the field, this book reflects on the experimental results, develops and matches theory to practice, evaluates the strengths and weaknesses of the technology and techniques introduced, and considers applications in a wider context. The development process of moving from prototyping to small-scale or mass manufacture, with a commercial case study. Students studying embedded systems using ARM technology, Professional embedded systems engineers, and software engineers developing embedded systems. Rob Toulson is Professor of Creative Industries at the University of Westminster. He holds a PhD in the field of digital signal processing (awarded by Anglia Ruskin University in 2004) and a first degree in Mechanical Engineering from Loughborough University (1999). Rob has a number of year’s industrial experience in digital signal analysis, control systems design, rapid prototyping, and model based design, as well as commercial experience in sound engineering and music production. His main focus is now in developing collaborative research between the technical and creative industries. Professor of Creative Industries at the University of Westminster, London, UK. Tim Wilmshurst is the author of Designing Embedded Systems with PIC Microcontrollers. He has been designing embedded systems since the early days of microcontrollers. For many years this was for Cambridge University, where he led a development team building original systems for research applications – for example in measurement of bullet speed, wind tunnel control, simulated earthquakes, or seeking a cure to snoring. Now he is Head of Electronic Systems at the University of Derby, where he aims to share his love of engineering design with his students. I just want to leave one comment on this book. As you know, mbed is very actively updating their source codes. And OS5 version is currently used now. This book should update this new OS5 version API.